FOUNDER PROFILE : Dounne Alexander. Being a strong advocate of ancient 'self-healing' traditions, Dounne (65), has consistently promoted and educated the nation on the health enhancing benefits of merging natural foods with medicinal & culinary herbs for optimum health. but thankfully my grandmother's strong faith, intuition, herbal knowledge and tender loving care - enabled me to survive against the odds. steeped in the selfless tradition of sharing information and knowledge in which to benefit others. Being raised in the Caribbean, I was extremely fortunate to experience an amazing quality of life obtained through living in a pollution free environment; on a rich diet of natural foods; good old fashioned home-cooking; home-made herbal remedies and on the spiritual belief that the 'universal creator' has provided adequately and abundantly for all our needs through nature. Acknowledging 'food' as their main life-source, my ancestors would also pray for blessings, healing & guidance at every stage of its development from tilling the soil, planting the seeds, harvesting the crops to the final preparation of each meal or remedy". "This was the blue print that has shaped my life." nurture, nature and social responsibility are the key elements that govern Gramma's." Dounne (mother of two) created Gramma's in 1987 from her tiny kitchen in the East End of London and subsequently rose to fame to become one of Britain's most respected businesswomen - supplying prestigious stores such as Harrods, Selfridges, Harvey Nichols and Fortnum & Masons, plus the top 7 national supermarket chains. The proud recipient of 8 National Awards, Dounne has also self published 2 books; is a motivational speaker for schools / universities, the over 50's and businesses. 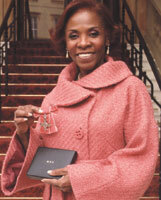 In 2007, Dounne was honoured by the Queen with the MBE for her outstanding services to the British Food Industry. and is calling on you to 'JOIN HANDS' and be a part of this historic journey of enlightenment, restoration, empowerment and HOPE. the Public Health Minister approved her extra-ordinary herbal products for use in hospitals and hospices palliative care programmes as part of on-going research. Gramma's Philosophy ] Founder Profile ] Gramma's Products ] Charity Work ] Contact Us.